March 1963: Initiated East African Industrial Promotion Services (I.P.S. ), a development company to encourage and expand the role of private enterprise in the Third World. July 12, 1963: Constitution of the Councils and Jamats of Shia Imami Ismailis of Africa was introduced. August 9, 1963: Tanga Jamatkhana was officially opened by the Honourable Rashidi Jumaane Abdallah, Regional Commissioner of Tanga Region. 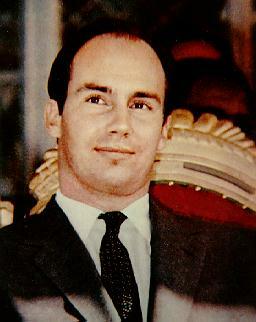 Prince Karim Aga Khan sent his "best loving blessings for the success you have had in the construction of the new Jamatkhana." September 6, 1963: Mowlana Hazar Imam arrived at Nairobi to attend opening of training school and nurses' homes at Aga Khan Platinum Jubilee Hospital by President Jomo Kenyatta. September 8, 1963: Left for Congo visit as State Guest of the Government. November 21, 1963: Reached Karachi from Zurich on his way to Phillipines. Performed opening ceremony of big Jamat Khana at Kharadhar and laid foundation stone of health centre and maternity home at Garden, Karachi. November 21, 1963: World Muslim Congress held reception at Karachi in honour of Mowlana Hazar Imam. November 24, 1963: Inaugurated first anniversary celebrations of Mindanao State University of Muslims at Maravi, Philipines, and spoke on "Islam's Glorious Past". Also read convocation address at Kamil Islam College. November 25, 1963: Returned to Karachi from Philipines and left for Europe. December 9, 1963: Arrived in Nairobi on his way to attend Zanzibar Independence celebrations. December 12, 1963: Witnessed Independence celebrations of Kenya as a Special Guest.